We have pioneered rain garden clusters (located close to each other) and find they create several advantages: reduced construction costs, more measurable environmental impacts, greater community participation. 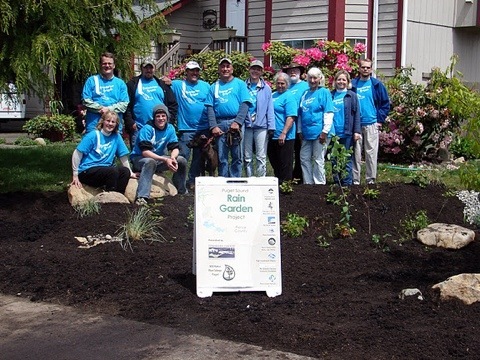 Rain Dog Designs has organized several rain garden cluster projects across Puget Sound, and we are pleased to showcase these examples. The City of Seattle recently announced a breathtaking expansion of their RainWise program and the opportunities for cluster installations there are tremendous. A rain garden is a shallow depression of compost amended soils, planted with native plants and hardy cultivars, and covered with a finishing mulch. Rain gardens infiltrate and filter rain water from nearby roof downspouts and hard surfaces that would otherwise pollute local rivers, streams and lakes – and ultimately Puget Sound. 8th Avenue NW, Puyallup, WA. August, 2009. 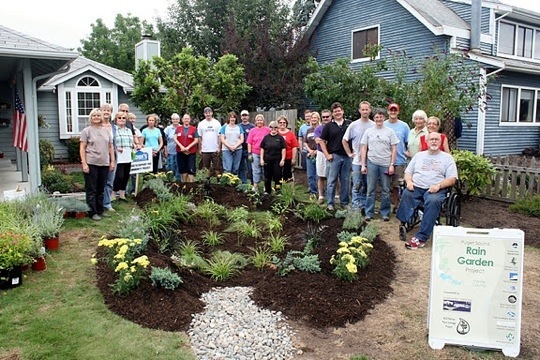 This first cluster installation brought together several partners, including a neighborhood, to design, construct and plant 7 rain gardens over two weekends in August. There are now more than 20 rain gardens along three blocks of 8th Ave NW. 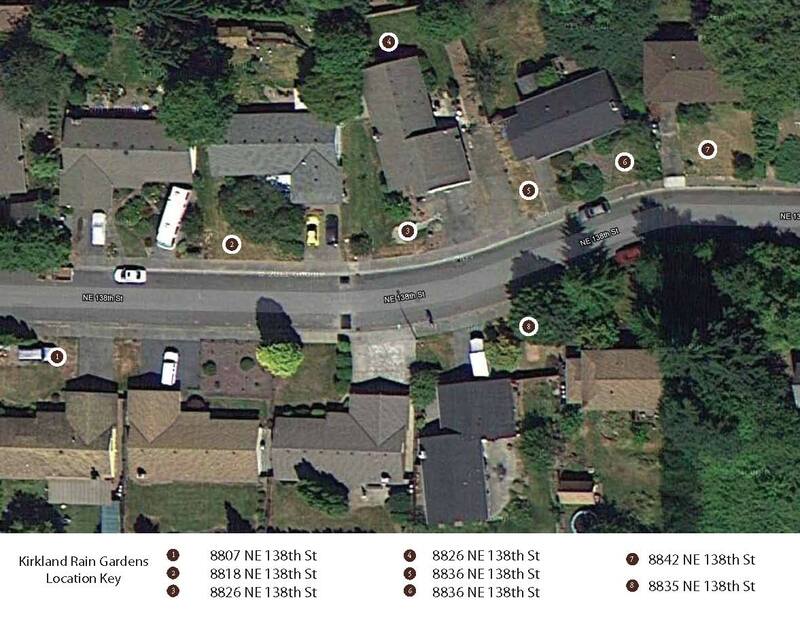 These continue to serve as models and inspiration for rain garden clusters in other Puget Sound neighborhoods. Baumgartner Place NE, Eatonville, WA. May, 2010. 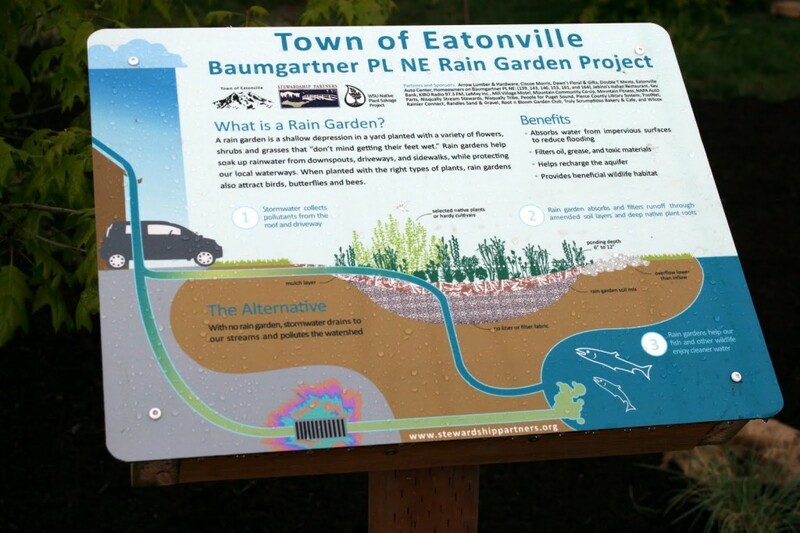 Eatonville resident Sally King responded to a local newspaper ad promoting free rain gardens for residences in Town. She investigated and found the real hurdle to getting a rain garden for her home was to convince five nearby neighbors to do the same – Sally persevered to recruit those homeowners. She has succeeded in transforming her neighborhood into one with six rain gardens that protects downstream habitat along nearby Mashel River. 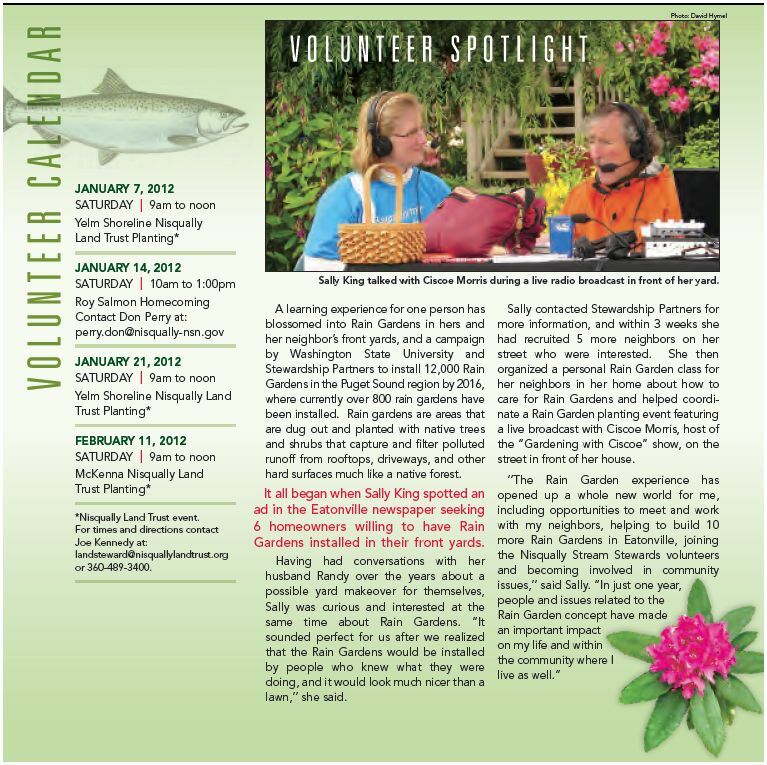 Sally King is interviewed on KIRO radio’s “Gardening With Ciscoe”. Page 12 of the Yil Me Hu. Totem Ocean Trailer Express (TOTE), Port of Tacoma. April 2011. 100% of the storm water from one of the 4 outfalls in the TOTE complex that would otherwise go into Puget Sound is being treated and infiltrated inside a cluster of three rain garden cells. 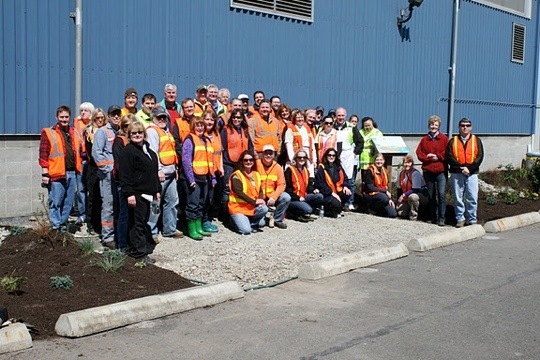 This unique industrial rain garden project, about one year in planning and completed in April 2011, was constructed by Rain Dog Designs in collaboration with Stewardship Partners and a number of local partners as part of the 12000 Rain Gardens in Puget Sound campaign. 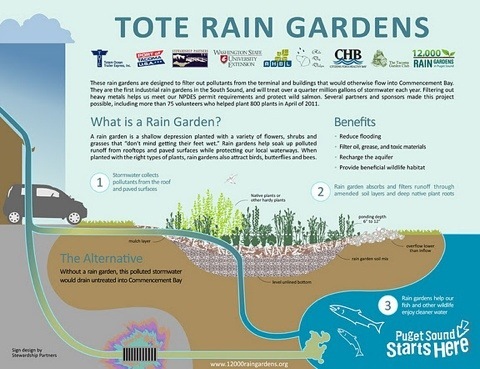 The rain garden design and installation was originally conceived by Rand Lymangrover, TOTE environmental manager, as a tool to filter storm water going into Commencement Bay in Tacoma. It is valued at $50,000, and a comparable designed and constructed sand filtration system to achieve the same results is estimated to cost in excess of $300,000. 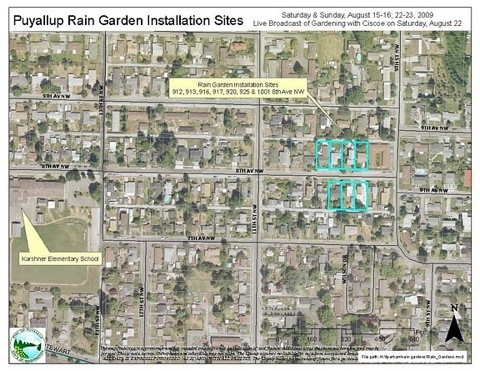 This 8 rain garden cluster in Kirkland’s Finn Hill neighborhood protects the upper Juanita Creek area from erosion and poor water quality further downstream and into Lake Washington.